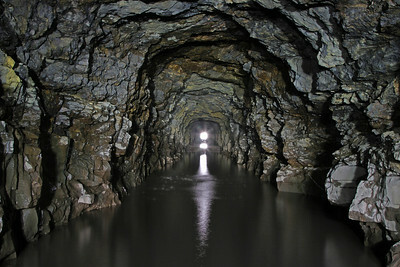 Canals and railroads developed in Eastern Pennsylvania during the early 1800s to transport anthracite coal from the Lehigh and Schuylkill Valleys to Philadelphia. The more remote Northern Coal Field of the Lackawanna and Wyoming Valleys remained largely untapped due to the difficulty of transport through mountainous terrain. To open the Northern Coal Field to the New York and New England markets, the Delaware & Hudson (D&H) Canal was completed in 1828 from the Hudson River at Rondout (Kingston) to the Delaware River at Lackawaxen and on west to Honesdale. 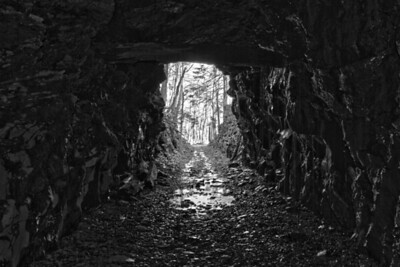 Opening just one year later, the D&H built a gravity railroad from the canal terminus at Honesdale across Moosic Mountain to the coal fields at Carbondale. Following success and expansion of the D&H coal operations, a second gravity railroad was opened to the D&H Canal in May of 1850. Built by the Pennsylvania Coal Company, this 4'3" gauge railroad linked the company's mines near Port Griffith (now Pittston) to the D&H Canal at Hawley and was likely the longest gravity railroad in the world. The PCC consisted of two tracks, an eastbound "loaded" (or "heavy") track and a westbound "light" track, which at points diverged up to three miles. The loaded track was 46.7 miles with 12 planes while the light track stretched 43.6 miles with 10 planes. Unlike other gravity railroads such as the D&H, the PCC didn't rely on horses or steam locomotives. Each plane used a stationary steam engine (three were initially powered by water wheel) and cable to haul a train of coal cars up an incline. The cars would then drift down a level at approximately 15mph with a drop of 6 inches per 60 feet (0.8% grade) to the base of the next plane. Planes 1 through 11 were located on the first 19 miles of the loaded track between Port Griffith and Moosic Mountain east of Dunmore. Approximately 1100 feet from the top of plane 11 (elevation 1975'), trains crossed the ridge through a 755-foot tunnel and then proceeded downgrade for 28 miles (with just a single plane) to the canal at Hawley. The PCC railroad began with approximately 900 coal cars, but hundreds more were built during its early years. Passenger trains were added between Dunmore and Hawley in 1874, primarily as a tourist attraction, and consisted of two 20-person passenger cars plus a baggage car. By 1863, with a railroad link completed between Hawley and Lackawaxen, the PCC gained independence from its rival D&H. Coal was transferred directly from the gravity railroad to the Erie Railroad at Hawley, avoiding the D&H Canal altogether. This arrangement continued for two decades until the PCC sought a conventional steam railroad alternative to the gravity railroad. In 1882, with financial assistance from the Erie Railroad, the PCC began construction of the Erie & Wyoming Valley Railroad which generally paralleled the light track of the gravity railroad. Following the opening of the new route, the final gravity coal train operated December 18, 1885, and the tracks were removed just months later. 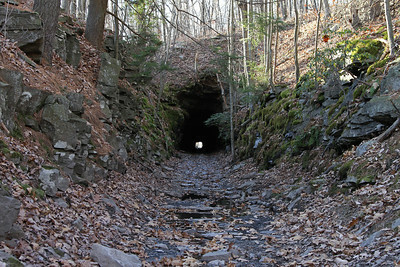 Today, the tunnel remains in good condition and is used in an ATV trail network on Moosic Mountain. As part of Level 11, the tunnel slopes from west to east and water collects at the east portal. 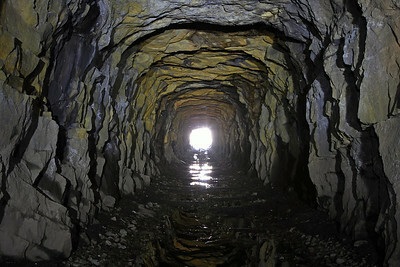 The tunnel is unlined with the exception of a single horizontal beam remaining from a previously timbered east portal. The right-of-way for planes 9 and 10 and their associated levels are still located on Moosic Mountain, as is Plane 11 and the first two miles of its level. 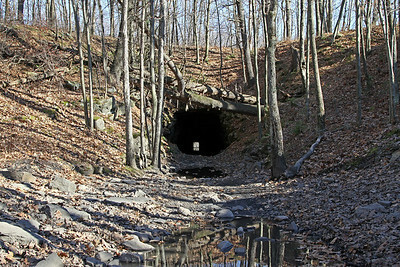 Approximately one mile east of the tunnel, the right-of-way crosses the former Moosic Lake Railroad grade which operated from Scranton to Moosic Lake from 1902 to 1909 as a steam railway, and 1910 to 1926 as an electric trolley. Shortly beyond this intersection, the PCC grade is obscured by residential development at Mt. Cobb.